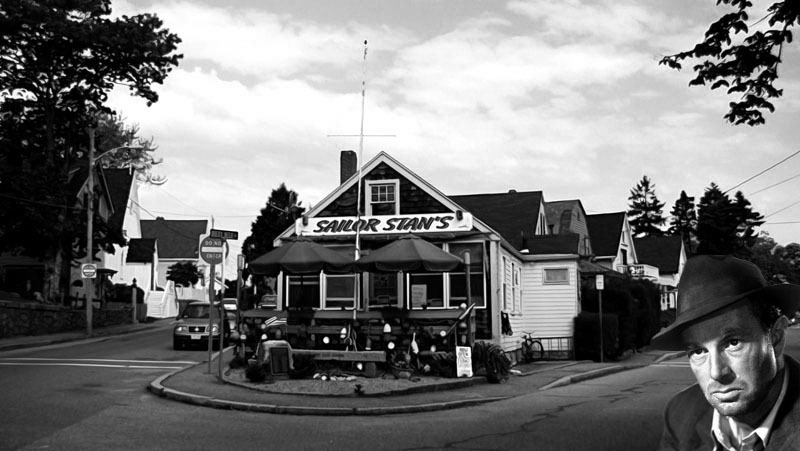 That Sterling Hayden (1916-1986) was a famous actor from the 1940’s-1970’s, who stayed on Rocky Neck for a time and liked to eat at Sailor Stan’s, where he sat in the middle booth? Rocky Neck artist, L.A. Dahlmer, recalls sitting across from Hayden at the popular Rocky Neck breakfast spot. Hayden returned to Gloucester in 1983 for the release of Joseph Garland’s book Down to the Sea: The Fishing Schooners of Gloucester, the introduction of which he had written. “To be truly challenging, a voyage, like a life, must rest on a firm foundation of financial unrest. Otherwise, you are doomed to a routine traverse, the kind known to yachtsmen who play with their boats at sea… cruising it is called. Voyaging belongs to seamen, and to the wanderers of the world who cannot, or will not, fit in. If you are contemplating a voyage and you have the means, abandon the venture until your fortunes change. Only then will you know what the sea is all about. ‘I’ve always wanted to sail to the South Seas, but I can’t afford it.’ What these men can’t afford is not to go. They are enmeshed in the cancerous discipline of security. And in the worship of security we fling our lives beneath the wheels of routine – and before we know it our lives are gone. What does a man need – really need? A few pounds of food each day, heat and shelter, six feet to lie down in – and some form of working activity that will yield a sense of accomplishment. That’s all – in the material sense, and we know it. But we are brainwashed by our economic system until we end up in a tomb beneath a pyramid of time payments, mortgages, and preposterous gadgetry, playthings that divert our attention for the sheer idiocy of the charade. He dropped out of school at 16 to go to sea and ended up in Gloucester, where he worked as a Grand Banks fisherman and learned the art of sailing. He was mate on Irving Johnson’s Yankee on its noted circumnavigation in 1937. He was navigator on the Essex-built schooner Gertrude L. Thebaud under Captain Ben Pine in the 1938 Fisherman’s Cup races v. the Canadian schooner Bluenose. Partly due to the intense media coverage of those races, he was discovered by the press: his photo in the Boston Post captioned “Thebaud Sailor Like Movie Idol” led to modeling opportunities in New York and a call from Paramount Pictures. After captaining a voyage to Tahiti, he signed with Paramount in 1941. The blonde, 6-foot, 5-inch actor thrilled audiences in some 60 films. Dubbed the “Beautiful Blond Viking God” by Paramount Pictures, he is best known for his roles as General Jack D. Ripper in “Dr. Strangelove” (1964), for which he was nominated by BAFTA as “Best Foreign Actor”. Other noted roles were a corrupt cop in “The Godfather” (1972), Roger Wade in “The Long Goodbye” (1973), Leo Dalco in Bertolucci’s “Novecento” (1976), and a comedic turn as the CEO in “Nine to Five” (1980). He often expressed his dislike for acting, stating that he only acted to pay for his sailing. Utilizing his love for the sea and knowledge of sailing, he also authored the best-selling 1976 work “Voyage: A Novel of 1896”. He was married three times with six children, and died of prostate cancer. Hayden was a genuine adventurer and man of action, not dissimilar from many of his movie parts. I remember Ssterling Hayden well and last saw him on Rocky Neck when he was in Gloucester to sign Joe Garland’s book. I still have a copy of his book, “Voyage”. Quite a charactor. That was a great read and a notable post…..
What a great little profile, E.J. I learned more about the legendary Sterling Hayden from your post thanin the 31 years I’ve lived on Cape Ann. I have a photo of Hayden sailing on the Thebaud with Captain Ben Pine, if you’d like to see it. Fred, I’d love to see it, and talk to you about a collaboration on a West Wharf piece, which I understand you have some good before photos of. I’ve been getting alot of good inside info over here. I trust he didn’t dine at Sailor Stan’s with “The Turk” Sollozzo or Michael Corleone. Bad idea. I remember Sterling Hayden sitting at the bar at Finnerty’s. He was a regular and always enjoyed talking with the young ladies and telling “movie star stories”. What a great piece! You are doing so much to enliven Rocky Neck, back to the place I remember. Please keep up your voyage of discovery and reportage! I thought this was fascinating myself, so I’m glad other people feel the same and have additional Sterling Hayden tidbits to add. Thanks Bruce, I really didn’t know Rocky Neck before coming here so don’t know how it used to be; but I have a life’s mission to lively up wherever I happen to be, and right now it’s Rocky Neck, and I love it. My Dad the Great Artist! Paul Sr. Told me an “Endearing” story of Sterling Hayden a long time ago when we were watching one of his movies, on a Sunday afternoon on tv38. When He was a kid (my dad)Growing up at the Fort. My Dad and his friends would dive off the dock where Ben Pines Schooner was Docked and Sterling Hayden who was a litttle Older then them would yell “HEY YOU LITTLE GUINEAS GET OFF OF THERE!” What a nice Guy, Huh? One day in 1986 I happened to walk up the hill on the street where I owned a building in Sausalito ,Ca. I see Sterling puttering on an antique type motorcycle.He looked very sick at the time.We exchanged a few pleasantries .A few month latter he was gone (Nov 1986} I Knew him and Spike Africa from years before when the Wanderer used to anchor offshore in Richardson Bay.Coincidentally a similarly thing happened to me in 1964.I lived on the Wanderer for 2 weeks in Papeete after our race to Tahiti ( June) in November she was lost on the reef in Rangiroa and dyed there. End of an area ! Great addition of your wonderful memories.